To close out the summer we took a Labor Day weekend trip to Newport, RI. I highly recommend it if you’re in the neighborhood. 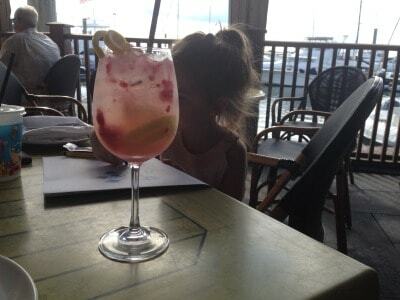 We ate at The Mooring restaurant right on the harbor, where the meal was delicious and the drinks were lovely (that’s my 3-year-old daughter coloring in the background). I’d recommend the restaurant but not this particular drink, as it tasted much more like tonic water than limoncello. The limoncello was barely detectable. The trip was fantastic though and we visited First Beach late in the afternoon which meant vast expanses of sand near the cliffs. A perfect beach weekend.